Designed to help you or a loved one recover in the comfort of your home, our team of medical professionals closely monitors and implements a physician-ordered plan of care. 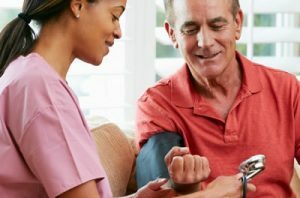 Your at-home medical treatment can be more comfortable, convenient and just as effective as care received in a hospital or skilled nursing facility. Every patient’s needs are different, and Homeland HomeHealth delivers individualized treatment plans to best promote healing, independence and quality of life. Our highly-trained medical team has expertise in wound care, cardiac care, palliative care, fall prevention, rehabilitation services, intravenous therapy and more. Homeland HomeHealth specialists include nurses, physical/occupational/speech therapists, a nutritional counselor, social workers and Certified Nursing Assistants (CNAs). The team works closely with the patient’s physician so your doctor stays informed of your goals, progress and outcomes. Make Homeland HomeHealth Your Choice. Our dedication to compassionate care and medical excellence is unsurpassed. Costs for home health services are typically covered by insurance, and we can assist you through the referral process upon request. Homeland HomeHealth is certified by Medicare with deemed status and accredited by Community Health Accreditation Partner (CHAP). Contact HomeHealth to discuss how we may support you and your family.